In order to send text messages from your database using Twilio you must first set up an account with Twilio and then link it to your database using the following steps. If you are currently set up with Plivo and would like to switch to Twilio, you must first clear out your Plivo account information from Tools > Edit Settings > Text Messages. Save your changes, log out of your database and then log back in to see the changes. You can then proceed with the Twilio set up. On the left menu select Text Messages. In the Twilio Account Information section click the Connect button. If you already have a Twilio account click Login. If not, complete the Twilio account information with your name, credit card information, address, email address and click Authorize. Jackrabbit will now connect your Twilio account to your database and you will be returned to the Text Messages screen in your database where you will see that your Twilio account information has been updated to show your Twilio Auth ID. Before you can begin texting you will need to buy at least one phone number. Buying more numbers allows you to send a higher quantity of text messages each day. In the Twilio Account Information section in your Jackrabbit database (Tools > Edit Settings > Text Messages) click the Buy Numbers button. 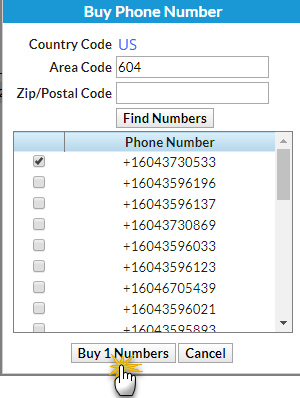 Twilio will offer you numbers in your area code but you can also search different area codes or zip codes and then click Find Numbers. Select the number(s) you wish to buy and click Buy Numbers. You'll receive a message that your number(s) were purchased successfully. Numbers must be purchased as above, through your Jackrabbit database, and not in your Twilio account directly. 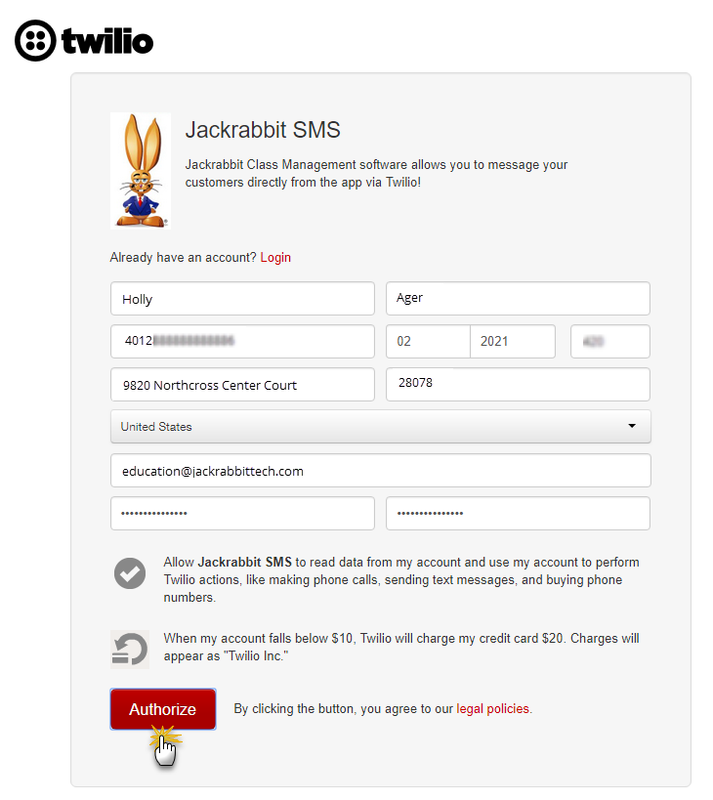 Numbers purchased from your Twilio account will not carry into Jackrabbit. When you have successfully purchased your text number(s) you will be asked if you would like to enable texting, click Yes. You will receive an email from Twilio informing you that your balance fell below $10.00 and that your credit card has been billed to recharge your account. All replies to text messages sent from your database are received in the form of an email. In the Options section of the Text Messages screen, add an email address(es) to the Notification Email(s) field. All replies to text messages are received at the email address(es) listed here. You can specify multiple addresses such as email1@email.com; email2@email.com. If you choose to leave this field blank, replies to texts can still be sent, but you will not receive the reply. You are now ready to start sending text messages with Twilio through your Jackrabbit database! Visit these articles to learn about the next step which is opting in message recipients: Opt-In Contacts & Students and Opt-In Staff. From Tools > Edit Settings > Text Messages you can access your Twilio account by clicking the Go to Twilio Account link. In your Twilio account portal you are able to view pricing information, add funds, make changes to your auto-recharge amount, view your useage summary, and more. To delete one of your texting numbers click Manage Numbers button on the Text Messages screen (Tools > Edit Settings > Text Messages).